Is state law again forcing homeowners to sell to investors? TEMPE, AZ — As Dorsey Place Condominiums in Tempe were being built in 2007, Jake Geller worked with the developer to design accommodations he'd need to live comfortably. He lives with Duchenne muscular dystrophy, an illness that progressively weakens muscles, and uses a motorized wheelchair to get around. To improve his quality of life, the developer installed wider doorways, removed some walls, lowered countertops and other modifications to the general floorplan. Geller thought he'd found the place he would live for the rest of his life, but in March he and his fellow owners received notices of their condominium association's intent to terminate. "Basically giving us 60 days to find someplace else," he says. Geller and his owner neighbors were the latest victims of Arizona's Condominium Termination law. It allows investors to reach 80 percent ownership and take over, then dissolve the HOA. They then force the remaining 20 percent to sell at fair market value, an amount determined by an appraiser hired and paid for by the investor-run HOA. This is usually done with the goal of converting the complex completely into apartments. 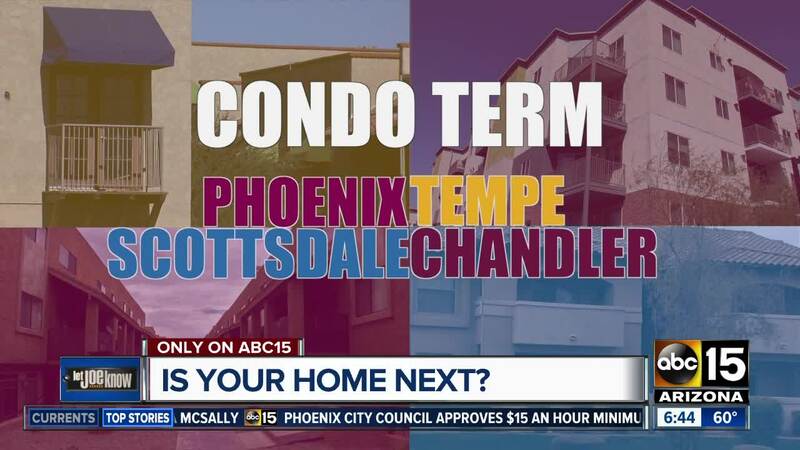 Since 2015, Let Joe Know has reported on this happening at four other condominium complexes around the Valley. The law was amended in 2017 to allow homeowners their own appraisal, the right to arbitration if the values differ by more than five percent and an additional five percent for moving costs. Right now lawmakers are considering House Bill 2687, which would force investors to verify they have the 80 percent needed, split HOA bank account funds with owners and give guidelines for choosing appraisers and arbiters. But are the changes enough to make the process fair? One of Geller's neighbors says investors offered just over $240,000 for their unit. They paid more than $420,000. Geller stands to lose even more than money. He's be losing a home made just for him. "They're looking at dollars and cents," he says. "They're not looking at what it actually means to me." We did not get a response from the California-based investment group which is trying to take over Dorsey Place. Once on the assessor's site, type in the address of the complex to pull up ownership records. Look for one owner for several properties. Check to see how closely the sales occurred, and for how much they were sold. Those are good indicators of whether or not your complex is being targeted for a takeover.